Samsung’s new mobile payment service, called Samsung Pay, is rolling out to more countries shortly including Singapore. Australia is planned to receive it later this year. Samsung announced support for Samsung Pay shortly after Apple Pay was launched. It’s currently live in three of Samsung’s largest markets: US, China and South Korea. Samsung Pay has five million registered users worldwide. The total transaction volume the first six months after launch was about $730 million. Samsung currently offers its payment service on seven devices: Samsung Galaxy S7 Edge, Galaxy S7, Note 5 and four models in the Galaxy S6 family. Swipe up using the home button at the bottom of the device. Alternatively, launch the payment app. Authorise the transaction using the built-in fingerprint scanner or enter the pin code. Hover or the in-store card reader. Similarly to Apple Pay, Samsung Pay relies on NFC technology (Near-Field Communication) to enable the transaction. This implies that both the device and the payment terminal need NFC installed. An issue, especially in New Zealand, is that the majority of EFTPOS terminals lack NFC. According to VISA NZ only about 20% of terminals support NFC. 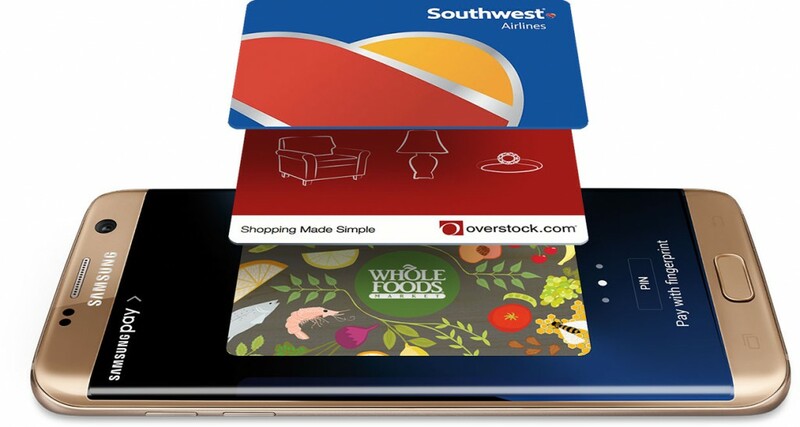 However, unlike Apple Pay, Samsung Pay also supports LoopPay, which replicates the magnetic strip on the back of the credit card. Hence, Samsung’s payment service will have a broader reach than Apple’s. LoopPay wont work for all payments. For example, parking meters, where there’s a physical slot, wont be able to support LoopPay. In addition, LoopPay might still require a physical signature. Source: Business Insider. 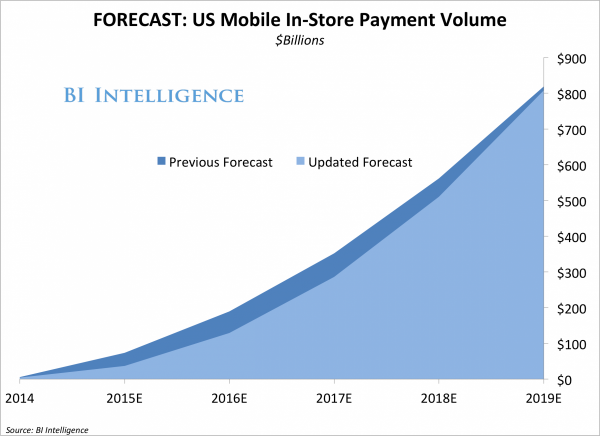 US in-store mobile payment volume forecast. The number of mobile payments worldwide is predicted to increase rapidly in coming years. Business Insider forecast that mobile payment volumes in the US will grow from an estimated US$200 billion this year to US$800 billion in 2019. It will most likely take a few more years to achieve such growth in New Zealand, but progress is being made and support for NFC is increasing among local retailers and Visa’s Token service that replaces sensitive data with a hard-to-crack digital token is being rolled-out now. In addition, local banks have become more technology savvy in recent years, so that the critical parts of a mobile payment infrastructure are slowly forming. Previous Previous post: HTC 10 Released – Comeback for HTC?